By Coleen Ellis, founder of the Two Hearts Pet Loss Center and writer for Pets Best, a pet insurance agency. The year of firsts after a pet’s death can be very difficult. 365 days of first events, where the reality of the death continues to be a daily reminder of the “new normal” and that a beloved pet is no longer here with us. 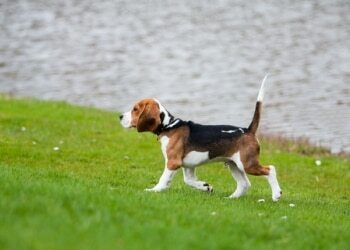 It’s the first spring day of the year, a day that your little beagle friend would have loved to go for a walk. As you fondly think of him, you find comfort knowing your beagle is walking in the meadows elsewhere, beyond Rainbow Bridge. It’s the first snowfall of the year, a day that your beautiful Golden Retriever would have loved to be bouncing around outside. Rolling around with snow on his nose, creating those big Golden Retriever snow angels, but now the reality is that he truly does have his angel wings. It’s the first Christmas there’s not a gift under the tree for your grumpy old cat, who in all of his nastiness would almost smile at the new treats in the gift sack. The Christmas stocking stays in the box this year too. One morning, the phone rang, it was Paula. It had been one month since Paula’s beautiful black and white bunny, Oreo passed away. He was a source of support and strength during Paula’s battle with cancer, and letting him go was especially difficult for her. I suspected the one month mark was hard on her, and she called for a bit of support. My suspicions were correct. When I answered the phone, I heard sobs on the other end. After assuring her I was there to listen once she was ready to talk, she began to catch her breath enough to tell me what had upset her. Paula and her son regularly played board games and Oreo just loved interrupting in the cutest of ways. He would walk across the board, knocking all the pieces to the floor, all the while looking adorable doing so. Today when Paula and her son played a board game, reality hit once again. All the game pieces stayed intact, and no ornery, darling bunny was there to knock them off. There was no laughter as pieces flew through the living room, only tears, sadness and the realization of a new life without Oreo. The year of firsts, those things that trigger an emotion as we remember a life we shared with an amazing little creature. Through the seasons and holidays, and even board games….forever rest in peace Oreo.